Disney’s Live Action Dumbo is coming out this weekend. Did you watch Dumbo growing up as a kid. It is a Disney classic. Plus, my family’s favorite and most iconic part of Disney World. We sent Myla to review Disney’s Live Action Dumbo for us! Remember Dumbo? The 1941 Disney cartoon classic about an elephant with really large ears? Of course you do! Everybody does. Now take that beloved character and run it through a Tim Burton (Nightmare Before Christmas, Beetlejuice, Edward Scissorhands, etc.) filter. You might expect to find a demonic version of our sweet elephant mixed with Burton’s signature black and white worms and squiggly lines. You’d be wrong. Mr. Burton hung up his weird mechanics (mostly) and left us with a beautiful and sweet live action retelling of Dumbo. Burton doesn’t gloss over the horrible beginnings of Dumbo, either. Sensitive children may be upset on the treatment of Dumbo and his mother. They weren’t treated well in the original and it carries through into the remake. Unlike the original Dumbo, the animals do not talk in this version. They story revolves around a circus run by Max Medici (Danny DeVito). His employee, Holt Farrier (Colin Ferrel), is home from the war and reunited with his children, Milly (Nico Parker) and Joe (Finley Hobbins). Medici hires Holt to take care of the new elephants, Mrs. Jumbo and Jumbo Jr. After Jumbo Jr. is renamed Dumbo* and shows off his flying talents, V.A. Vandevere (Michael Keaton) comes calling to incorporate the baby elephant for an act involving trapeze artist, Colette Marchant (Eva Green) at his futuristic theme park. 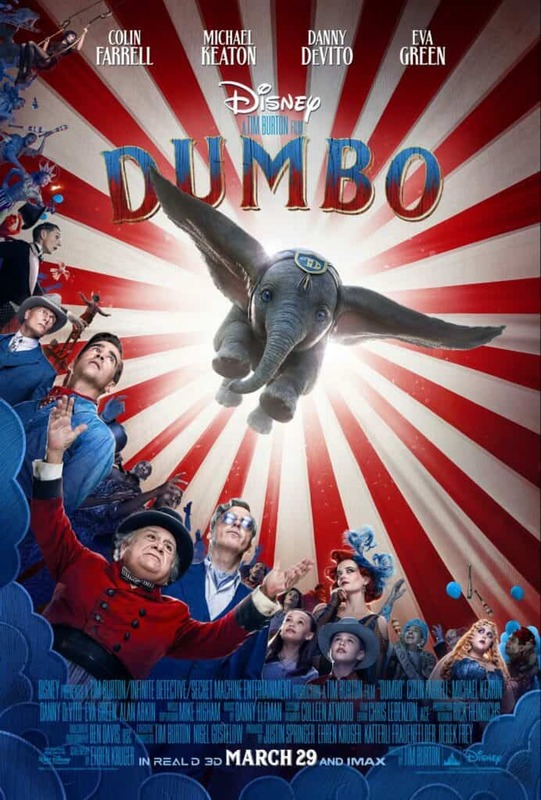 The story obviously differs here from the original, but it’s fun and gorgeous and kids and adults alike will be soaring right along with Dumbo! The musical numbers are gone in the new Dumbo, but not forgotten. Look out for the clever ways Burton and his musical muse, Danny Elfman, use them throughout the film. Pink Elephants on Parade left me and Dumbo awestruck. Beautiful. * Though it’s really cool that Dumbo was born in Missouri in this adaptation, it’s less cool that Missourians taunted the poor pachyderm and dubbed him Dumbo. Come on, Missouri! “Show-Me” some humanity!!! This sounds like an interesting movie. I usually enjoy Tim Burton’s movies. Kiddos should really like this movie, parents too. I always loved the story Dumbo as a child. I know I would love this movie even as an adult because of the story behind it. I will try to get all my grandsons together to go see it. Hoping it works out. If not, if I win we can watch on movie night at my house.